Savoca (pronounced with the stress on the first syllable) is one of those just-being-discovered destinations which you should visit as soon as possible. A quiet and crumbling hill village perched high above the sea, this is a really atmospheric taste of authentic Sicily. 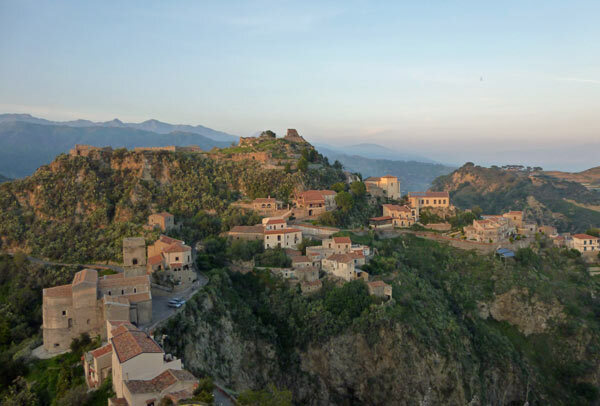 A world away from the touristy bustle of over-developed Taormina just down the coast, Savoca offers a chance to breathe deeply and see what an unspoiled Sicilian hill village can be. A recent restoration programme, including the development of a classy 'scattered' hotel resort, has opened the village to visitors, but a short stroll still passes abandoned dwellings, crumbling churches and amazing rural views. Savoca is initially confusing: clusters of dwellings and churches are distributed around a couple of hilltops and over the ridge linking them and slopes below. It all begins to make sense once you start exploring, though. The village and its sights are all easily walkable, if you don't mind some uphills. Otherwise there's a little open taxi which will take you on a tour or ferry you up and down. One hilltop is topped by the very fragmentary remains of castle walls (inaccessible at the time of writing), dating to the twelfth century. The other is crowned by a former church, the Chiesa del Calvario, and three wooden crosses where the village's Easter re-enactments take place. The village's 'destination' hotel (Resort Borgo San Rocco) is in Borgo San Rocco, a hamlet on the far side of the castle hill from the 'main' part of Savoca. A lane winds up and down circling this hill so you can make a circular tour. As you tour the panoramic lanes, the view encompasses sea, mountains, steep green valleys, cultivated terraces, sheep, distant hill towns, ruins and far-off Etna, Sicily's giant. There's a great deal of pleasure to be had in Savoca from gently pottering around the hilltops at different times of day, admiring the varied views and changing conditions: from spectacular sunsets to moody low clouds drifting past the houses. Savoca has plenty of charms of its own, but for occupants of the occasional tourist buses which make their way here, the main attraction is the village's connection with Francis Ford Coppola's film The Godfather. 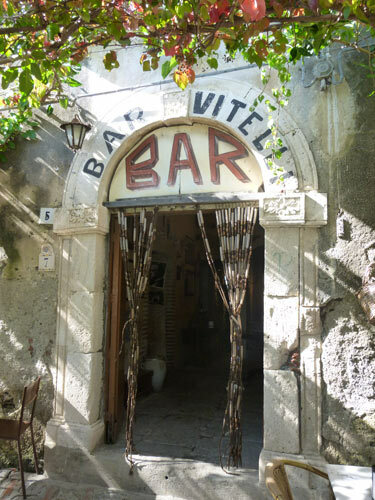 Scenes for the movie were shot at Bar Vitelli, on the village's little square, and Coppola fans - along with all Savoca's other visitors - will inevitably spend some time relaxing outside this pleasant little bar. Bar Vitelli has outdoor tables under a leafy trellis, stray cats that beg for food and a simple interior with a room lined with stills from The Godfather featuring the village. Tourists pose for photos in the doorway (sometimes hamming it up with a fake gun). Occasional tour parties troop up from a coach parked on the town's access road below. The bar serves drinks including wine and Sicilian favourite almond milk along with light food such as salads, bread with toppings. For a summer treat there's refreshing lemon ice granita with zibibbo on the menu. The main appeal of Savoca is the general atmosphere and setting. Hopefully the out-of-the-way location and lack of big sights and beaches will save the village from being too over-run by tourists. There are, however, a few specific sights of interest. There is a village museum (small admission fee), where exhibits include mementoes and photographs related to the filming of The Godfather - as well as a photograph of Falcone and Borsellino, Sicily's two heroic, murdered anti-Mafia judges with the caption "Sicily is also this". As well as its Hollywood claim to fame, the museum is full of interesting records of village and rural life (descriptions in Italian and local dialect). They include 'recipes' or spells for detecting Malocchio - the Evil Eye - and for casting it out, as well as more practical items such as farming and kitchen implements. Photographs show villagers from the past,including a scene of harvesting by hand and with oxen, dated as recently as 1988. A cage contraption was apparently used as a ducking stool. A reconstructed bedroom gives an idea of how Savoca's villagers would have lived until recently. The catacombs at the Capuchin monastery (Convento dei Cappuccini), a short walk up the road from the town square, offer Savoca's most macabre sight. Like the famous catacombs in Palermo, the crypt here houses a collection of mummified corpses, plus an assortment of skulls in niches. Dating to the 18th century, and dressed in their best clothes, these past citizens of Savoca are a creepy reminder of the past. The fine fabrics worn by the dead gentlemen vary in their state of preservation, but one particularly elegant ensemble includes a floral embroidered waistcoat, cravat and knee-breeches. This is a curious and fascinating sight, and a vivid insight into Sicily's idiosyncratic relationship with death, but it is also the stuff of nightmares and visitors will be unlikely to forget the silent and petrified scream on a 200-year old face. Entrance is by donation, photography is banned and visitors are reminded to respect the dead. Savoca has three notable churches. San Michele was closed when I visited, and subject to a crowdfunding campaign to restore the frescoes of the elaborate but decayed interior (see right-hand links panel). The church of San Nicolò, also dedicated to Santa Lucia, perches on the hillside beneath the rocky castle summit and was featured in a wedding scene in The Godfather. Decorations include a modern fresco behind the altar, a silver statue of St Lucy and a display of ex-votos of eyes (Santa Lucia/St Lucy had her eyes put out and is the patron saint of sight). 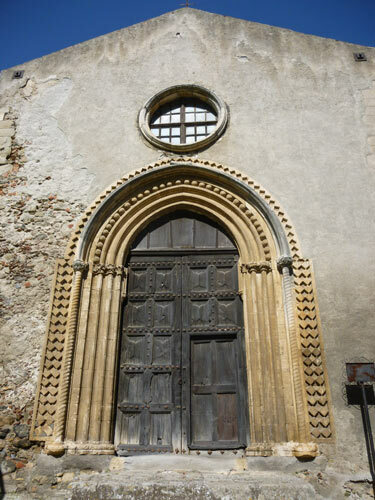 The Chiesa Madre, Savoca's Mother Church, was founded, along with the village, in the twelfth century. It sits in a panoramic spot on a narrow ridge, above a crypt once used for mummifying corpses, and is worth visiting to appreciate its mellow aged atmosphere and some faded Byzantine frescoed saints. 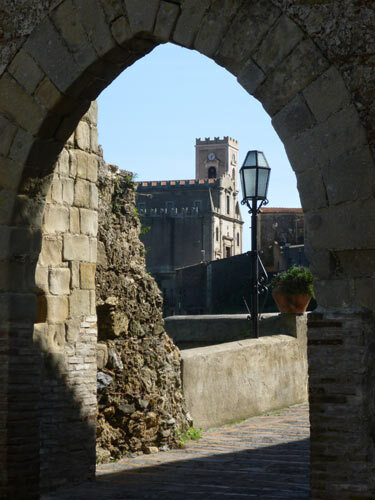 Close by is one of Savoca's architectural highlights: a beautiful medieval window. Savoca's houses vary from well-restored to utterly ruinous, and from humble peasant's cottages to grand abandoned dwellings. One particularly ancient and crumbling ruin, beneath the castle, has been identified as a synagogue. The museum, catacombs and churches all have limited opening times and will generally be closed for several hours in the middle of the day. The latest times should be available on the website of the village comune (see links panel on the right). Savoca is too small to offer many services to visitors, but there are a couple of bars in the village, a few Godfather souvenirs to buy, an excellent little baker who operates from his front door close to the village square (Via Chiesa Madre 2 - follow the warm smell of baking), and a choice of places to eat including the Borgo San Rocco hotel (see below). I visited Savoca overnight so spent two half-days in the village. That's all you really need to see the views and sights. With its peaceful, traditional atmosphere and the understated luxury of the village hotel, it makes a really good stop for recharging on a tour of eastern Sicily, and a great contrast to busier destinations. 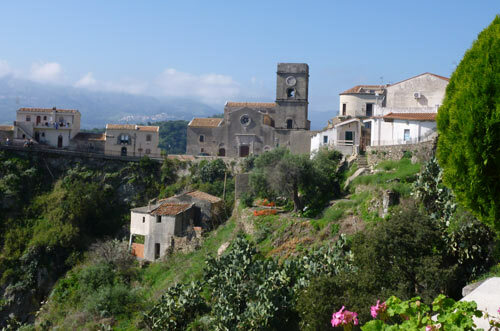 A longer stay would offer a relaxing opportunity to absorb some rural Sicilian atmosphere, to head into the countryside or - if you have a car or hire a taxi - to tour nearby sights. The area around Savoca is called the Val D'Agrò, and includes other picturesque, low-key villages and sights. The biggest attraction is the church of Santi Pietro e Paolo, close to Casalvecchio Siculo, a famous monument featuring Sicily's varied history in its architecture, which is a mixture of Arab, Norman and Byzantine. Savoca is on the eastern coast of Sicily, half an hour's drive north of Taormina; the two destinations make a good combination for a holiday of contrasts. The most convenient airport is Catania. Savoca is connected by bus, operated by Jonica Trasporti, with Santa Teresa di Riva on the coast below. This bus continues to Casalvecchio, offering a potential excursion from Savoca. Santa Teresa di Riva is on the railway line linking Messina to the north with Taormina, Catania, and Siracusa to the south, there's also a bus between Taormina and Santa Teresa di Riva. The easiest way to arrive though, is by car or taxi. If you are driving yourself, get detailed directions from the hotel - the streets here are tiny, steep and narrow lanes and you will want advice on the best approach route. For the same reason, if you are arriving by taxi, consider booking a driver through the hotel as they will know the best way to arrive. We found it good value, and much easier, to travel by local taxi rather than public transport when we arrived from Taormina and when we departed for Catania Airport. If you're staying in Taormina, you can book excursions which visit Savoca, although you won't get the same experience as an overnight stay. If there are rooms available, visitors should definitely consider the lovely Resort Borgo San Rocco. Created from restored houses in the one of the tiny 'hamlets' which make up Savoca, this resort hotel is full of character - and surprisingly good value (read my review). Even one night here is a special experience, with staff welcoming guests into their 'family' and serving up delicious locally-sourced food as well as impromptu spaghetti-making sessions. We loved it. A short and steep walk downhill, the hotel has a swimming pool on a grassy terrace overlooking a valley. There are also a couple of B&Bs in the village including the well-reviewed B&B Il Padrino, named after The Godfather.